Where is Bob? 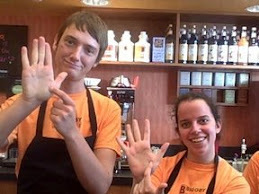 : Success Brewing In Metro Detroit ...Go BIGGBY ! Much has been made lately of the things that Detroit allegedly lacks. Some feel they cannot move here because there just is not enough culture. Others assert that there are no coffee shops within the limits of our city. Although we have both, we’ll focus today on some coffee shop owners who are insistent on the opportunities in Metro Detroit. Tucked between Wayne State University, the Museum of Contemporary Art – Detroit, and the Detroit Symphony Orchestra, Jose Cayao is confident his Biggby Coffee franchise is in a great location. 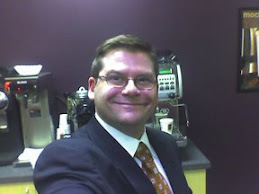 He had personally seen the success of Biggby in university settings, so he only needed to look at the site for his Detroit location once. The location is on the first floor of the Studio One apartment complex, with the University Towers residence hall behind it, giving him a large source of potential customers within easy walking distance. Although the store has been open for over a year, there are still plenty of people who are walking into a Biggby for the first time. While the students give them a steady base, many people attending events in the area are attracted by a strong monthly marketing plan within the Cultural Center. With all of the new faces, sincerity is key for the thriving coffee shop. “When you are sincere in what you say and do, you had better deliver because people expect that from you,” says Cayao. What customers expect might just be a cup of coffee. What they get is a friendly, sincere customer service experience with coffee as a medium to gather around. He credits that to the five-day training he and his wife Irma insist their employees attend to keep their standards high. Cayao is optimistic enough about Metro Detroit to own five other Biggby franchises and remains open to owning more. For him, the opportunity is great. “Even with our economic climate, this is the biggest market in the state and there are only 27 Biggby stores,” he says. When Rose Glendinning was working in Boston for an investment bank, her brother Joe tried convincing the East Lansing native to come back to Michigan to open a coffee shop. He had written a business plan for the ideal coffee shop to fulfill the requirements for a class and decided they needed to act on the idea. After some research, they found Biggby was a close match for what Joe had envisioned and decided to open a store in the upscale suburb of Bloomfield Hills. Just three weeks ago, they opened their second location in nearby Birmingham. 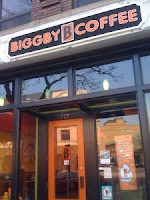 Glendinning noted that the appeal of Biggby was the strong business system they already had in place that allowed for some self-expression. When you walk into the Birmingham location, you will notice a bin of dog treats by the front door. They promote a different non-profit organization each month, allowing for “Guest Barista Nights” as fundraisers. You might even see her Dad delivering coffee to neighboring businesses. That family atmosphere is one they work hard at developing. It is that family atmosphere that made it an easier decision to leave behind a big promotion in Boston. While the number of hours she works is probably the same, she enjoys working with her brother. Their mom, a Curves franchise owner in the Lansing area, is active in helping them get featured in local media. Dad enjoys running the Facebook page. The community has embraced their Birmingham location quickly, even with three national coffee chains and an independent coffee house on the same block. Two franchise owners. Seven different communities in metro Detroit. Both determined for business success in metro Detroit. Wonderful article. Congrats to Jose & family and Joe, Rose & family on showing metro Detroit the BIGGBY way! What a great story! You guys are popping up everywhere. Both of these locations are perfect and have amazing people working them. Keep it up! B happy! As Biggby chases down Starbucks as the leading coffee chain in metro Detroit, the Starbucks people will echo Butch Cassidy "who ARE those guys??" Ah, in that word made famous by George W. Bush, it is great to be "misunderestimated." Michigan is. So is Biggby Coffee. And the competitors of both do so at their own peril. It's GREAT to see more and more stories about our continued success in Detroit, and we're just getting started there! Well deserved kudos to the Cayaos and the Glendinnings!